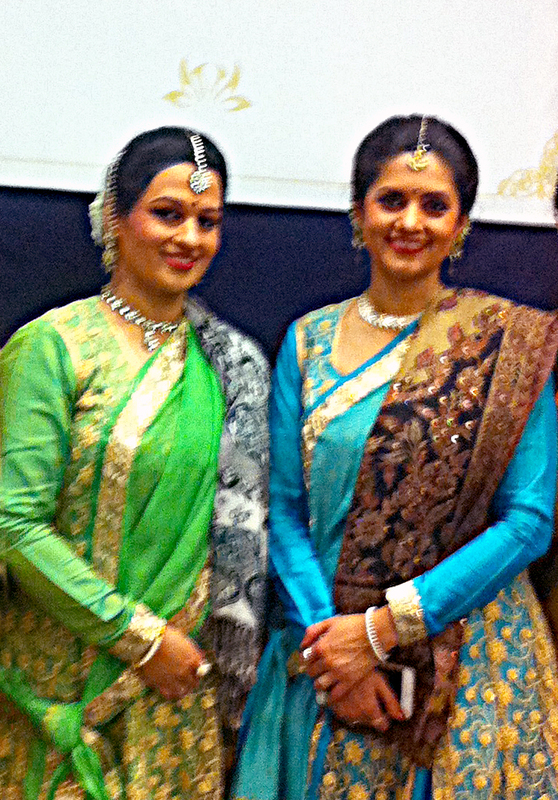 October 15, in Santa Clara, CA, Shambhavi Dandekar presented a concert of Kathak dances performed by expert performers including herself and guest artists as well as performances by her students. This was a brilliant program: the students added a great deal to the presentation while the artists were able to explore the further reaches of Kathak both as movement art and storytelling. It was a delightful excursion through the realms of the classical dance art from ancient times in Northern India. The program opened with extraordinary works performed by Tejaswini Sathe, Director of SISK in India and sister in law of Ms. Dandekar. As Ms Dandekar had injured her shoulder and needed to restrain her movements, Tejaswini flew in from India. A dance element that was most noticeable was her eloquent arm movement. In Kathak, the essence of the dance is usually the complexity of the rhythms beat out by the feet. Ms Sathe’s movement was expressive throughout her body. She opened and defined the space through which she moved by the graceful, generous use of arms, while traveling through the stage space still keeping rhythms in her feet, arms and head. She performed Devi Stuti, a tribute to the feminine energy in the universe, and Rudra Taal, an explosion of challenging rhythms. Mr. Rann Shinar ably performed a story in Kathak. He enacted a son devoted to Vishnu, a cruel father angry at his son’s devotions, and Narsimha, the fourth incarnation of Vishnu who came to slay the father whose true identity was the Demon King. Chief Guest of the event was Kala Ramnath, Indian violinist, singer, composer, and recent recipient of the Sangeet Natak Academy’s award, India’s most honored arts award. SISK’s adult students performed a musical teen tal in Raag Kalaavati. It included traditional dances, footwork and gestures. The eight dancers were accompanied by music by Chinmay Kolhatkar. The students performed very well. Obviously well trained and well rehearsed, their performance and the dances performed by other students created an excellent tour through Kathak, both its technique and meaning. Ms Dandekar achieved something special with her students: she had choreographed works which were suitable for their abilities and therefore let them shine. The dances were clean, strong, and expressive. The announcer and narrator was Samita Pradhan. She was outstanding. The commentary added a great deal to the audience’s appreciation for the program. Tabla player Tanmay Bichu was central to the performance. Performing with Shambhavi he played abstract forms of tabla compositions, Peshkaar, Kaida, and Chalan in a ten beat taal, Jhaptaal. One needs to see and hear a fine tabla performer such as this one to appreciate and be knocked off one’s feet by the seemingly endless mathematical complications of the rhythms and the speed of the musician’s hands and fingers as he plays. These complex rhythms were incredibly matched by Ms Dandekar’s feet as she danced with him. It appeared to be a conversation but one that might not be put into words. The audience must be available in the moment, all senses tuned only to the rhythmic sounds. Once it stops, one may become aware that during the rhythmic slicing and mixing of time in the music, time had stopped. Senior students danced Chatrang, meaning four colors, representing four elements of music depicting storytelling (Nritya). The four are Bandish, melodic composition; Taraana, abstract syllables set to melodic composition; Sargam, notes of melodic composition; and rhythmic syllables. It is fascinating to this audience member how much of the music and dance plays with abstractions even while a story floats on top. In Chatrang, Krishna and the Gopis (young women keepers of cows) play Holi in Vrindavan. Holi is the holiday when devotees exult in spraying bright colors on each other. Vrindavan is the garden in which Krishna loved to frolic as a child. 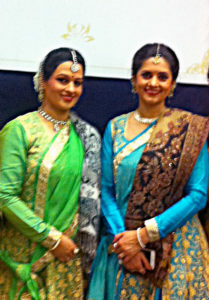 These dancers succeeded at communicating the essence of the story while dancing Kathak’s rhythms and turning movements. For the audience, it was another, more advanced step in learning about Kathak. In Chatrang and all of the program, the costumes were elegant and colorful. Care was taken to match or vary color and styles, but there was never a chance for a great costume innovation to trip up a dancer. Costumes were by Sheetal Oak, Isha Phadke, of Pune, India. Three artists visiting from other cities performed a Shiva Drupad in Raag Natbhairav and taal Dhamaar, a fourteen beat cycle. Each of them is the founder and director of a Kathak school and each one comes to the Bay Area to acquire further learning from Ms Dandekar. They are Meenal Chakradeo, Meenal’s Academy of Performing Arts, San Diego; Shaili Bhandari, Nrita Shaili School of Kathak, Phoenix; Ekta Popat, Storytellers School of Dance, Houston. Their dance had choreography and vocals by Param Guru Pandit Maneesha Sathe. These dancers made a beautiful and powerful trio. Triveni, meaning the confluence of three rivers, was a dance of the three moods of Raag Kedar: taraana (abstact syllables set to melodic composition), tabla compositions, sargam (notes of melodic composition). These students in their third year of Kathak study performed beautifully. Ms Dandekar demonstrated her polished acting skills in an Abhinaya piece, Yashodhara. Named for the wife of Bhagwaan Buddha, the touching dance represented the sacrifices of a wife whose husband is seldom available to her and leaves her alone. She longs for a true marriage of companionship and love. When, at last, her husband returns, he has become Gautam Buddha and helps others to achieve enlightenment. She understands and follows. The dance is based on a Hindi poem by Maithili Sharan Gupta. A change of pace was a challenging Kathak piece set to music by the contemporary rock group, Coldplay. The song, Sky Full of Stars, expressed the dancers’ passion for dance and its role in their lives according to the narrator. It was an exciting, energetic piece skillfully performed. The dancers reveled in the challenges of cross cultural art. The program closed with a fantastic match up with Shambhavi Dandekar, Tejaswini Sathe, and Tanmay Bichu. They outdid each other and themselves, each set of rhythmic divertissements over coming the next. It was dazzling! 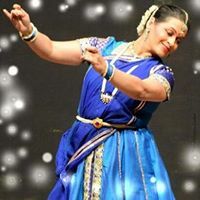 This entry was posted in Hedgehog Highlights and tagged Kala Ramnath, Kathak, Meenal Chakradeo, Meenal's Academy of Performing Arts in San Diego, Nrita Shaili School of Kathak in Phoenix; Ekta Popat, Param Guru Pandit Maneesha Sathe, Samita Pradhan, Shaili Bhandari, Shambhavi Dandekar, SISK, Storytellers School of Dance in Houston, tabla drums, Tanmay Bichu, Tejaswini on October 18, 2017 by Leslie.